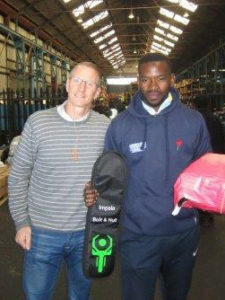 July was a proud month for all of us at Impala Bolt & Nut, where we supported our very own team member, Keketso Chabedi, who was selected into the National Team to represent South Africa during the INAS Tri Nations Cricket tournament in England. Keketso, who works on our Boltmakers as a setter, has been part of our team since March 2012, and is an incredibly talented sportsman. The INAS Tri Nations Cricket tournament has been played bi-annually since 2005, and stirs up a friendly rivalry between South Africa, Australia and England. Impala Bolt & Nut sponsored Keketso with equipment and full pay for the entire period. This was Keketso’s first flight and he loved it! This was an experience that Keketso will remember forever. He said that he loved England, and made many friends who he’s keeping in touch with via WhatsApp. The tournament ran from 9 – 21 July, where the teams played T20 games and one match of 40 overs. The SA team gave Australia a run for their money, and were overall runners up in the tournament. Keketso said that the first couple of matches were tough, thanks to the drizzling England weather that had affected the pitch, but he is proud of his performance. The highlight of his trip was beating Australia, where the SA team “really whipped them!” Keketso’s highest score was 52 runs, and he is determined to achieve more next time.